Mindblowing!!!! Too good!! I agree that we’d perhaps hate Roark if we face him in our surroundings, but the way the books presents him is superb. Peter Keating: The loser..Easily the most hateable character,but at the same time,it’s the character which you can find most easily around you. He starts on a great note topping his batch and all.But he’s never confident of what he does. He lives his life second-handedly,depending on others in all his decisions. His dependence on others’ is so much that he marries a woman she does not love,but she knows that her beauty will impress people and her connections will bring him business.He thrives on the work of others.We hate him,but are not many of us him somewhat like him?? The book makes you hate him from the start and you continue to do so till the end. Ellsworth Toohey: The manipulator. It’s the kinda person many adore as being saintly or something. To the world,he appears to be as benevolent as one can be, but in fact he’s embodiment of evil and corruption. He has got the art of winning the people’s heart by showing himself as preacher n follower of selflessness. He hates people who have got real talent,but instead of attacking it straightaway,he chooses a different path to belittle talent: by appreciating the average aur mediocre stuff. The book makes you like him first, but by the end,u hate him more than Keating,who at last evokes some sympathy. In the first two halves of the book,you hate him,but as the book delves deeper into his character, you begin to love him more and more. Hey!!! Isn’t Wynand’s Banner almost like our TOI?? Howard is the heart and soul of the book.Well,i agree that the character is an ideal one and it’s a bit impractical to be Roarkish in our daily life,but the character teaches you how to respect self in an amazing way.He is a man,who lives his life for himself. He does not follow the conventions of the worlds,nor does he care what people think of him. His passion for his work is religious and the only reward he wants is the satisfaction that he did it himslef. His conviction for self is praiseworthy. His aura is so powerful that he’s able to change and have an impact on the other two powerful characters of the book:Wynand and Dominique. The highest point of the book is Roarks’s speech in the end:the stuff is really moving .He openly says “I wished to come here and say that I am a man who does not exist for others” Drawing parallel between the creator and the parasite,he gives excellent arguments,that make you think twice about the life you are living. Whether or not you find the characters realistic,there’s no doubt that the book as a whole offers you a lot of food for thought.It is a modern classic and definitely worth reading at least once. yeah,it’s pretty voluminous,but once you finish it,it’ll take some time before you can put Rorak and Wynand (may be Toohey too) off ur mind. 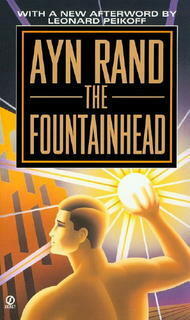 Hey.. Fountainhead is my favourite book.. its amazing how the author has depicted various forms of human society and how entwined each form is with the other….my best dialogue is when Toohey and Roark are standing infront of the Goddard temple after it was converted to a orphanage.. Toohey asks ‘so tell me what do u really think of me’ (not the words exactly but the meanin), and Roark says ‘ but i don’t think of you’ – that was where Toohey had lost. The book is about portraying the highly ignored individuals as the hero and the Hero’s of every other novels as the Villains. The writer is doing the job of Toohey by being a chauvinistic about the individualism and she became fanatic about the socialists. The world has been run by Toohey’s and not by Howard’s, She made that character a strong and interesting but unnatural to convince people that individuals are also be Hero’s. Though world is going towards the individualism and it will be the last phenomenon that will be the end of human race.